Step 1 Over a dish to catch the juice, cut the ends off each orange. Cut away the peel and slice each orange into three-eighths-inch crosswise slices, then cut each slice in half. Combine the sugar and cinnamon in a small bowl. Place the oranges in a large bowl and sprinkle with the sugar and cinnamon, stirring to coat. Step 2 Cut the dates into one-fourth-by-one-fourth-by-2-inch long strips, and add them to the oranges. Add the walnuts and orange flower water and gently stir to combine. In Recipes-list.com we have selected the most viewed recipes from category - Salads Vegetarian . Enjoy the best recipes specially selected for you! 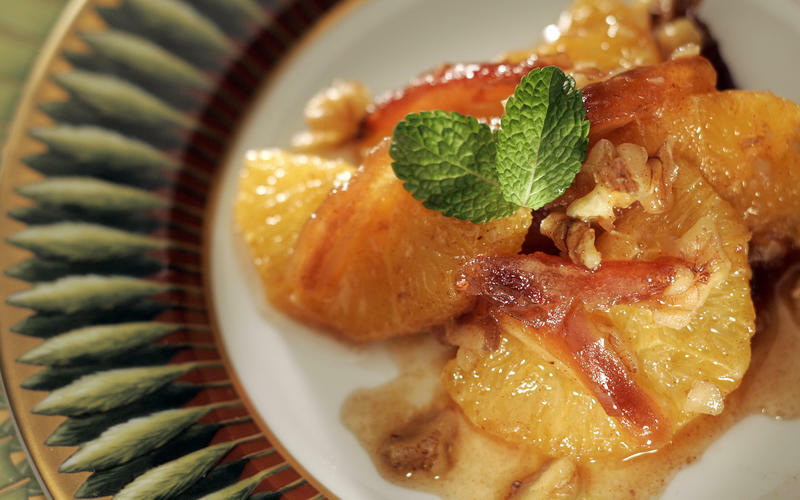 Joel Robuchon's orange-date salad is the right choice that will satisfy all your claims.